What is Scientific Management Theory? The concept or theory of Scientific Management is about the progress of science to substitute the approximation principal or hypothesis of the awareness and education of workmen. The Scientific information is always methodical, standardized and authorized knowledge; as scientific knowledge is logical and rational. The main intention of scientific management theory is to enhance economic efficiency, specifically labor productivity. This theory was considered as one of the best and initial effort where science was applied to management and engineering of process. Scientific management theory by Fredrick Taylor was a technique which was developed in order to enhance the efficiency of a work process. The theory was centered on systematic study of people, behavior and tasks. The chore of Taylor’s theory was that they followed the technique of breaking the work process into sub-tasks or least possible units with an intention to regulate the most efficient method for accomplishing a particular task. Also mentioned as classical management theory, scientific management theory made its entry in the early 1900’s in order to enhance worker productivity. Though the scientific theory of management provided tools for workers to enhance their output and efficiency, employees did only menial work and hence the theory criticism of the classical theory of management faced critics for developing an assembly-line atmosphere. With this as a reason, the theory was fallen out of favor by various companies but is still considered as a valuable tool in many companies for its principles. Employees must be elected based on their skills and abilities related to job. Incentives and wages provided to employees should be based on encouraging them and enhancing their output. The leadership within the organization should be one that develops a standard method for doing certain job with the assistance of scientific management theory. There should be attention on eradicating interruptions while planning work. Rule of thumb work methods are replaced with other methods which are based on scientific study of tasks. Let us discuss scientific management theory advantages or benefits. The scientific management theory is responsible for enhanced production as it concentrates on steady improvements in business operations. There is fruitful cooperation between managers and workers and hence enhanced team work is achieved. The harmonious relationship between the management and workers assists in production in the organization. The best part of scientific management theorists is that the managers are able to have good control over production. Employees become specialists in their field as they do the same task repeatedly; this makes it easy for the manager to have control over employees. Inaccuracy is decreased as the theory is based on experiment and observation for context-specific solutions. With better planning and decision making, accuracy is achieved. The theory stimulates the management to adopt a positive relationship with leadership. Cooperation amongst employees and managers enhances democracy in workplace. Hence there is decreased autocracy by following scientific management theory. The mechanization and latest use of technology in production of goods enhances productivity. Since there is enhanced large scale production, there is a decrease in per unit cost of production. With the theory piecework pay system is followed, where payment is monitored based in piecework. Here incentive is considered in order to enhance productivity and provide high wages for employees. With a higher productivity, there is an increase in wages for employees. The differential incentive plan provides higher wages to efficient workers. By this way the standard of living of the employees are made better. Planning ahead of time and prompt decision making are few good aspects of scientific management theory. With the help of scientific management theory there is triple benefits for the consumers. Consumers pay fewer prices and are able to get best quality products. They are also able to attain better living standards. They follow early working method and control where a management methodology is developed for the purpose of training, selecting and supervising them in a close manner. Since scientific selection and training methods are followed, it leads to a workforce which is best and enhances efficiency. Efficiency is also increased with standardization of techniques, tools, equipment and materials. The workers are also benefitted with development and scientific training as they are able to enhance their competency and knowledge. With the scientific techniques followed, there is better utilization of resources this in turn leads to increased productivity. Wastage and inefficiency of all means are eradicated with the theory. Also with the help of scientific investigation it leads to technological development. They also follow other quantitative techniques and modern studies are based. With the help of scientific management theory there is enhanced beneficial aspects for the nation. Some of them are increased production and less cost of production, industrial harmony and peace, every phase of society meets high standard of living, the national income is enhanced, and there is also quick industrial development with this theory. The role of Scientific management theory plays a crucial part in developing the nation. Work in lesser time is achieved with scientific management theory. The operations regarding productions are pre-established and lead to less production delays. With the assistance of this theory, work is carried out in a systematic manner according to pre-determined plans. Complete guidance and instructions are provided to workers in order to carry on with work as planned in advance. A proper atmosphere for working and conditions are developed with scientific management theory. Proper working schedules are followed with ventilation; adequate lighting, rest pauses, with proper safety, and other facilities are provided to patients. Large scale production and enhanced productivity moves forward for enhanced turn overs and more profit for investors. High profits can be reaped for self-financing so that the concern has a sound financial base. Since there is a healthy relationship and cooperation between management and labors, hence they have a cordial and harmonious relationship with one another. By this way, industrial disputes are reduced and peace in an industry is achieved. Mental revolution is a concept evolved by Taylor for development of mutual trust, understanding, and confidence between management and labor. 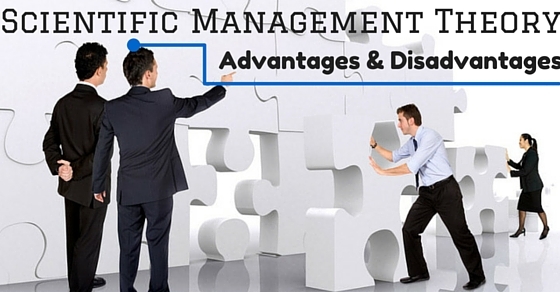 The following mentioned are few limitations or disadvantages of scientific management. The theory requires an investment of huge capital and is considered as a costly system. The establishment of work study, planning department, training of workers, and standardization requires more money. The management takes complete responsibility related to control and planning of work place activities. Since the managers take up control of the employees, they lack creativity, another reason of this is that since they repeat the same task, their chore is meaningless, monotonous, and tedious which reduces employee motivation. Though the capability to plan ahead is an advantage, the downside of planning is that it makes work inflexible and ridged and may lead to carelessness and dissatisfaction. This is directed to less productivity. With the application of scientific approach of management, the employees are focused on how well they perform their job and their statistics and results are produced along with a time frame. With this result, the employees may feel underestimated and also feel alienated which may direct them to absenteeism. Over bureaucratic activity may be a major disadvantage in any organization. A bureaucratic and strict organization may make the employees feel dissatisfied and this may lead to high staff turnover rates and may affect productivity. New staffs must be trained in order to adapt to new changes in the sector which leads to wastage of productivity time. The theory follows a specific approach for organizations and the employers gain control over the workers. This activity makes work mechanistic and treats the workers like machines. The theory focuses on efficiency, where workers were viewed as robots to speed up work. The workers lose skill level and autonomy work level; they aren’t beneficial for state of the art working conditions. Scientific management theory doesn’t work fruitful for teams and groups as they have the capability to abuse and exploit human beings which may lead to conflicts. There is no scope for individual preference with this theory. Functional foremanship was followed by Taylor, where the workers were required to report to eight bosses. By this way, the unity of command was broken, where the worker needs to report to just one boss. When there is no unity of command, there is confusion and disorder in the organization. By applying scientific management theory there is a separation of work such as in planning any function and executing them. Since management takes complete responsibility, there is a reduction in workers role into rigid and adherence procedures where, the workers have no idea. Since the scientific approach follows piece work pay system, there is not chance for any realistic bargaining regarding the wage rates, as the tasks are timed, measured and rated scientifically. There are more chances for financial loss as there are more changes that take place within the organization. With the application of this theory, men are replaced by machines which in turn lead to unemployment. By this way, fewer employees are required and many are chucked out from work. The scientific management theory pushes workers to rush to complete their work and complete work within stipulated time. By this way there is adverse effect on the health of the workers. With managerial decisions, there is strictness and stress for managers as they need to take responsibility for having complete control over workplace. By this way, there is pressure influenced in the work place for the workers too. Productivity and profitability was given importance which lead to exploitation of employees and they associated in trade unions. This led to the mistrust amongst employees and management. According to Frederick Winslow Taylor theory of motivation, employees do not naturally enjoy work and they require close observation and control. Taylor’s assumed that workers focused and was motivated by means of financial gains. But the real truth is that the employees aren’t motivated by finance aspects but by non-finance incentives such as social needs and more. The scientific management theory focuses on a narrow application. They are applied only at times when there is quantitative measuring of the employees. The theory is applied only for certain factories where the performance is measured in a quantitative manner. The theory is not adopted in service sector as here the performance is not measured in a quantitative manner. The scientific management theory is considered time consuming as it requires complete reorganizing and mental revision of the organization. The theory when adopted needs more time for standardization, study and specialization, or else at time of overhauling, the workers suffer. These are considered few advantages and disadvantages of scientific management theory. Hence it is suggested to make a complete research about the theory and review if it would be suitable for the organization and later adopt it. “The principles of scientific management” was published in 1911 by Frederick Winslow Taylor, where this theory was applied to the management of workers. This theory was adopted mainly by many organizations in order to improve productivity. In order to simplify jobs, tasks are optimized and the employees are trained to perform such tasks in the best way. Scientific management theories have worked in many concerns and made them beneficial, though it had minimal disadvantages. There is number of sources which best explains the good aspects of the theory. The experimentation was followed for a number of years and was concluded with classical scientific approach principles, advantages and disadvantages.